Manchester United manager Jose Mourinho has discussed Cristiano Ronaldo’s emotional return to Old Trafford in this season’s Champions League group stage tie with Juventus. The Portugal international first made a name for himself at United between 2003 and 2009, winning three Premier League titles and the Champions League with the Red Devils. The Daily Mirror report that United boss Mourinho actually turned down the chance to re-sign Ronaldo this summer before he left Real Madrid for Juventus. However, the same piece also quotes the 55-year-old as singing the player’s praises as he gears up to return to his old club for the second time, having also done so as a Real Madrid player in 2013. 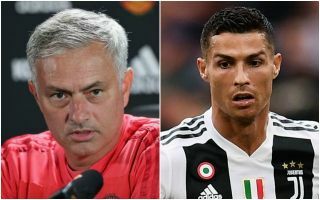 While Ronaldo is now 33 and enduring a difficult start in Serie A, Mourinho insists he is still a danger to his side as he discusses the prospect of facing him and Juventus, who now look among the strongest candidates to win the Champions League this season. “We know that in the Champions League, we have to play the biggest candidate,” Mourinho is quoted in the Mirror. “Juventus were always a big candidate but they have transformed themselves into the biggest candidate because they don’t hide that the investment they have made has been made to win it. “I think Cristiano will like coming back as he was happy to come back when he was at Real Madrid.